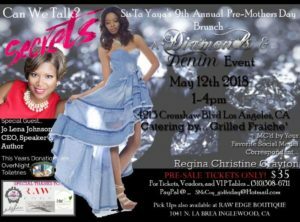 Jo Lena Johnson, The Absolute Good Resilience Coach, will be the featured speaker at the 9th Annual Sis’Ta Yaya’s Pre-Mother’s Day Brunch in Los Angeles, CA. This year’s theme is Can We Talk? Secrets. To purchase tickets call, (310) 308-6711 or pay through PayPal using SMcCoy_girlfriday@hotmail.com.